The innovative Greenworks Tools GMAX 40V Lithium-Ion Battery delivers high performance and efficiency among all Greenworks Tools GMAX tools. 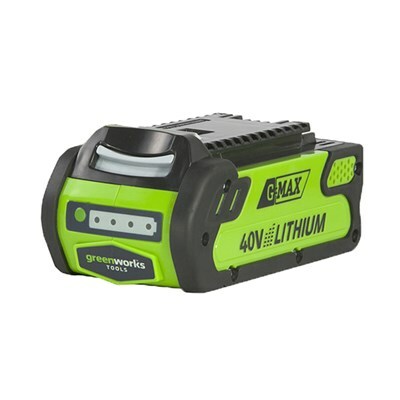 A quick charge time of 60 minutes for a 2Ah battery makes the Greenworks tools GMAX series of lawn tools a great option when looking to replace petrol powered products. Featuring a simple snap on and off design for ease of use and innovative battery charge level indicator, lithium-ion batteries offer no negative memory effect. From mowing and edging, to trimming and blowing, you can now complete your garden work with one battery platform that will provide you with the power and performance you need to get the job done quickly and efficiently.